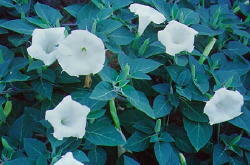 HABIT: Fragrant white or purple night opening flowers 4”-6” wide. Blooms all summer the first season. Large, fuzzy, dark green foliage, thick succulent stems that stink when crushed or broken. Dies to ground in winter but returns each spring. Spreads easily by seed. Native to Texas. CULTURE: Very easy to grow in any soil. Doesn’t always return as a true perennial. USES: Dramatic color and fragrance. PROBLEMS: Coarse, weedy, and poisonous. It’s pretty anyway. Tender skin can easily get a rash from contact with stems or foliage. 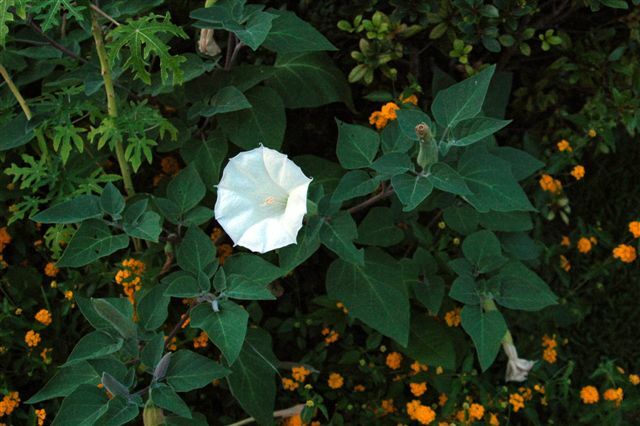 Mistakenly called Moonflower, which is a nonpoisonous member of the morning glory family. 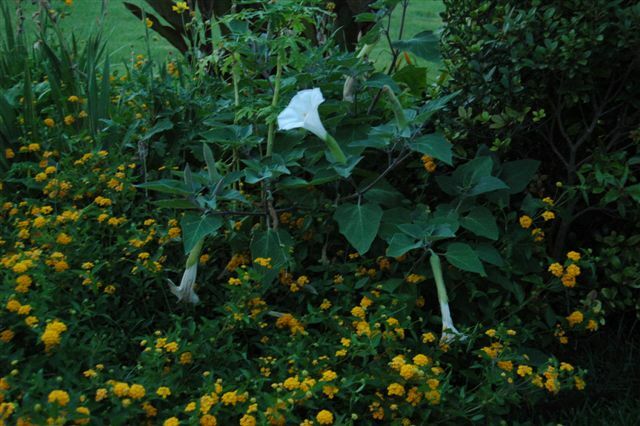 Datura metel has double purple flowers and is naturalized here in Texas. A closely related plant, Brugmansia sp. Has larger flowers in several colors that hang down.